A retired U.S. Marine who pleaded guilty to killing his girlfriend and dismembering her body with a machete will spend 26 years in prison, a judge ruled Wednesday. Brian Brimager, formerly based at Camp Pendleton north of San Diego County, pleaded guilty in February 2016 to second-degree murder in the 2011 death of his girlfriend, Southern California resident Yvonne Baldelli. 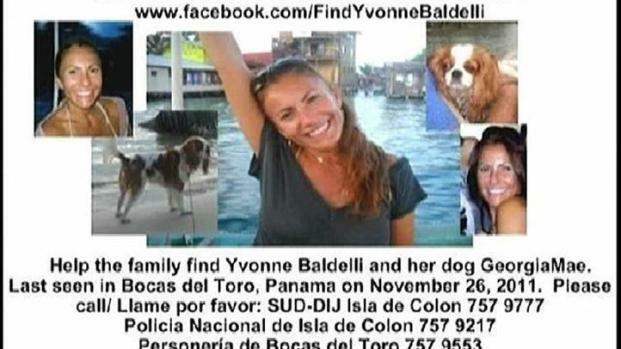 Baldelli vanished five years ago when she traveled to Panama with Brimager. Her remains were found nearly two years after her disappearance on a remote island near Panama. Brimager was sentenced in a San Diego courtroom Wednesday in front of dozens of Baldelli's loved ones, many of whom were in tears during the three-hour sentencing hearing. They addressed the court — and Brimager — directly, calling him "evil" and saying his lies over the years "tormented" Baldelli's family, prolonging the painful ordeal. Days after prosecutors disclosed that DNA of Yvonne Baldelli was found on a machete, Brian Brimager pleaded guilty to second degree murder. NBC 7's Matt Rascon reports. "Your life would have been easier if you just sent Yvonne home," Baldelli’s mother said. "You will have to answer to a higher power and I will never forgive you." Baldelli's childhood friend, Adrienne Markes, called the slaying a "disgusting, heinous crime" that warranted the maximum sentence. "The hardest thing I’ve ever had to do was to fly to Panama to help her family search for her body. He was arrogant enough to think he could get away with it," she said of Brimager. At the sentencing, prosecutors said Brimager published a social media post about the machete used to dismember Baldelli, which read, in part: "I bought it in the states before I moved down there...don't worry I only dismembered one stripper with it so it's hardly used:)"
Prosecutors said Brimager lacks remorse. Brimager offered the family an apology, but Baldelli’s loved ones called it a "hollow attempt to save himself." The couple left from Dana Point, California, in September 2011 to stay on Isla Carenero, an island off the Panamanian coast accessible only by boat. Baldelli was last seen at a restaurant with Brimager on Nov. 26, 2011. NBC 7's Dave Summers speaks exclusively with the family of Yvonne Baldelli, a Southern California woman who was murdered in Panama in 2011. Investigators believe her boyfriend, Brian Brimager, killed Baldelli before dumping her dismembered remains in a swamp. Brimager was formally charged with the foreign murder of a U.S. National on April 17, 2015, in San Diego. When entering his guilty plea, Brimager admitted he stabbed Baldelli in the back on Nov. 27, 2011, then used a machete to chop up her body. According to prosecutors, Brimager drugged and beat Baldelli, too, breaking her nose before he stabbed her. After dismembering Baldelli's body, Brimager stuffed her remains into a military-style duffel bag and garbage bags, according to court documents. He then hiked 1 1/2 miles to another side of Isla Carenero, where he threw the bags down an embankment into the remote Panamanian jungle. After the slaying, Brimager withdrew money from Baldelli's bank account and used it to buy drugs and alcohol, according to prosecutors. He also admitted to using a computer to communicate with Baldelli’s family members to conceal her death. Brimager sent emails from Baldelli's laptop for about a month in an effort to convince her family that Baldelli was not only still alive but was happy and had traveled to Costa Rica with another man, authorities said. "Those emails cruelly gave Yvonne’s family false hope that their loved one was still alive," court documents state. "As the family’s emails went unanswered, the pleas from her family became more desperate and heart-wrenching." The emails, prosecutors said, caused the family to delay reporting Baldelli's disappearance to authorities for about two months because they thought she was still alive. The family of Yvonne Baldelli, a woman who disappeared in 2011 after traveling to Panama with her boyfriend, Brian Brimager, wants justice. Baldelli's body was found in 2013 off the coast of Panama. Brimager is accused of covering up Baldelli's death. NBC 7's Vanessa Herrera reports. Court documents show Brimager also used the laptop to search for information on how to remove blood stains from a mattress. Prosecutors said Brimager lied to investigators about Baldelli’s disappearance and told them she had taken her laptop while traveling. In 2012, he was found with Baldelli's computer in his possession, at which point Brimager changed his story but said he never used the computer to send emails. Baldelli’s skeletal remains were found off the Isla Carenero coastline in 2013 — 21 months after her disappearance — by a Panamanian who found stumbled upon the duffel bag. Scientists identified Baldelli's body using DNA analysis on her skull and bones. Brimager has been in U.S. custody since June 2013 on charges of obstruction of justice, giving false statements to a federal officer and falsifying records. In April 2015, he was indicted by a federal grand jury in San Diego on a charge of foreign murder of a U.S. national. Brimager initially pleaded not guilty before reversing his plea in February 2016 after DNA evidence revealed Baldelli's blood to be under the handle of the machete. In addition to his 26-year sentence, Brimager was ordered to pay a $10,000 fine and to pay restitution of more than $11,000 to Baldelli's father. Family members of Yvonne Baldelli, missing since 2011, now has some answers.DNA testing positively identified the 42-year-old, who was last seen in Panama with her boyfriend. Former Camp Pendleton Marine Brian Brimager remains in federal custody on charges relating to the case. NBC 7's Nicole Gonzales reports. Baldelli’s niece, Lauren Beyer, said all those delivering victim impact statements in the courtroom Wednesday were speaking as "voices for Yvonne." "Life was much simpler before even hearing Brimager’s name," said Beyer. "After he murdered her, he teased the family by acting like he was Yvonne. He has a dark soul. Why did he have to do this and carry it on for so long?" Baldelli's father, James Faust, spoke of the hope he clung to after receiving Brimager's emails — and the pain he will endure for the rest of his life. "I am traumatized by guilt and anger," he said. "I am ill physically and emotionally. I can’t sleep at night." "It’s my understanding he cut her hands off and threw them over a cliff," he added. "Remorse is not in this man." Family close to missing Southern California woman Yvonne Baldelli say they are losing hope as the search lengthens. Lorraine Michelle Faust, Baldelli’s younger sister, said she "had not seen evil like this before." "My sister was tortured for months before she was stolen from all of us," she said. "He is a monster."